“This is Roller Derby: everyone eats sh^t.” Freudian Slit (psych student when she’s not playing derby) is explaining to me that nobody gets on a pair of skates unless they’re willing to fall down. But nobody lasts in Roller Derby unless they’re also willing to get back up again. Nearby players are running drills to practice their quick acceleration and quick stop skills. Sure enough almost on cue one of the players tumbles and in the same smooth motion picks herself back up. “Nice recovery,” another player shouts. 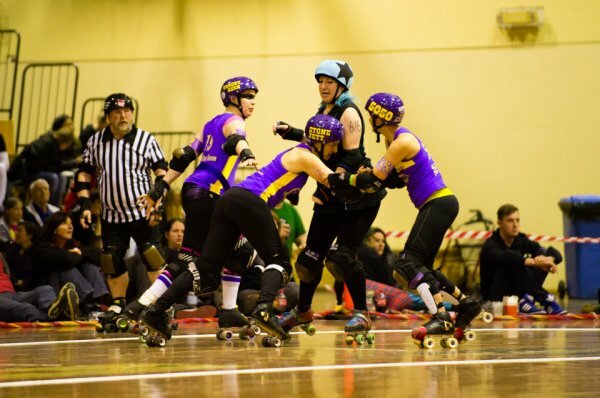 There are four teams in the Canberra Roller Derby League but they all train together. The policy is “League, then team, then player”. You can’t join the League because you want to be one of the Surly Griffins, you have to become a member of the League and then you get assigned to a team – might be the Griffins, might not. Your commitment to the League always comes first. So when the players train, it’s not as teams, it’s as the League. The player who just fell over might be one of the Black N Blue Belles, the player who shouted out encouragement could be a Brindabelter. It’s an unusual atmosphere for a sport. In fact there isn’t even a formal hierarchy: there are no coaches or captains with most decisions about tactics made organically and through consensus. There’s even flexibility about the uniforms: the days of fishnets and tutus are fading but players have a lot of freedom in what to wear. So long as they’re recognisable as part of their team it’s up to them whether they want to dress for style or for comfort. And yes, players take both options. 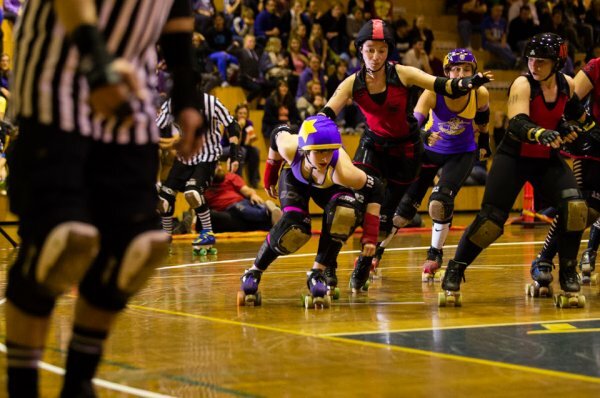 So Roller Derby is definitely a different kind of sport – probably the reason the Canberra Times infamously asked, “Is roller derby a genuine sport?” For anyone who is even a little involved with Roller Derby, the question is outright insane. Roller Derby is demanding. People say that you can do it with any body type, and that’s true, but the reality is that Roller Derby demands genuine skill, toughness and commitment – but more than that, you need strength. Out of the freshman intake this year of 60ish new players, only about 20 lasted. And those are just the ones who were selected as freshman. Many more didn’t even make the cut. But Roller Derby is shaking off its camp, kitsch image as more spectacle than sport. I thought there would be a great ritual around the adoption of derby names (I had some sort of combination of baptism and being initiated into the Masons in mind), but in actual fact players are pretty casual about their titles. A small but growing percentage are even taking the court under their own names. Among Roller Derby players – at least the ones who play at a top level – there’s a quiet understanding that new players who are excited about their derby name and how they will dress probably won’t last. It’s OK to enjoy this aspect of the sport – and it’s cool that Roller Derby allows so much self-expression – but you have to be ready for the hard work that comes with being part of a team. I asked these players if Roller Derby had changed them, made them more confident in real life. Surprisingly, the answers were tentative and reluctant. They said they enjoyed discovering their own strength and seeing what they could make of themselves, but they didn’t want to oversell the benefits. Just being a Roller Derby player doesn’t automatically make you hyper-confident in every part of life. But the experience is empowering – or, rather, just “powering”: the players see what they’re capable of, even if it’s only in one part of their life. It’s different, but it’s a culture that deserves a lot of respect. The players work hard to the point where even pointing that out is patronising. But there’s also a personal freedom you don’t really see in other sports. Roller Derby has always struggled a little with image, but after speaking with the players I genuinely hope it keeps its distinctive style and moments of flamboyance. There are enough sports that are over-regimented (I will risk making enemies by singling out Gridiron). I love that Roller Derby instead lets players have control over how they will present themselves (I will once again risk making enemies by singling out Netball). Roller Derby is awesome just the way it is. And it’s an important part of the Roller Derby season because the Grand Final is coming up (“The Hunger Jams”). The players that were helping each other out in training are about to go to war and the RiotACT has five double passes to give away – the first five people to say ‘Roller Derby Rocks’ in the comments below get the tickets. This is true because they are awesome! They have support organizations I am involved with, doing demonstrations @ both Gordon Primary and Southern Cross school. They are great nights out and just a lot of fun peeps, cause they always have time to chat to the fans! Roller Derby Rocks – I am doing fresh meat right now! (I mean, probably – I’ve never gotten to a match but I’d be happy to start).